In which area do you have to realise your project? Complete systems for indoor and outdoor sports facilities for football, five-a-side football, multisport, gyms, basketball, volleyball, ice-skating, running tracks and tennis which use high quality materials, realised with innovative techniques and certificates of the international sports associations. Complete systems for playground, certifiable as responding to the EN1177 norm, realised with high quality products which guarantee absence of maintenance, wear resistance and perfect color fastness during the lifetime. Join the world GommAmica and discover our commitment to guarantee your fun and your safety in total respect of the environment. FROM AN HIGH QUALITY GRANULE TO A FLOOR OF EXCELLENCE. GommAmica elaborates and produces complete systems and products for playgrounds and sports surfaces. GommAmica uses only raw materials of excellent quality, responding to the most strict technical specifications of the field. The resulting products, i.e. the GommAmica systems, result then indeed certifiable by the most important sports associations. Playgrounds and sports floors are places where our body has fun and tests itself searching for its own limits; consequently, the physical contact and the fall should not be considered exceptions. The GommAmica systems, especially that addressed to children, are certifiable according to the 1177 norm. The GommAmica systems provide the use, in place of EPDM, also of high quality SBR granulate in compliance with extremely strict technical specifications; a practical example of how it is possible to supply products of higher level in respect of the environment where we live. An additional aim of Gommamica is to guarantee a sure and repeatable qualitative standard in each installation, making easier the laying and reducing essentially to zero the accidents in the realisation of any floor. The instruction for the installers about the underlayer predisposition modality, the correct dosage of the components and the accurate calculation of the drying timings of the single layers allow to respect the timings arranged with the final customer, with evident reciprocal satisfaction. Complete technical specifications, indicating also the performances of the single components, guarantee to the installer the meticulous calculation of the necessary materials and, consequently, the preparation of correct quotations, avoiding the necessity of caution by ordering material quantitatively superior to the necessary one. GommAmica takes part in the most important exhibition events of the field providing on its social channels prompt updatings. Stay in direct contact with us, also to discover in advance the most prestigious realisations. From the beginning we have given a central role to the respect of the environment, to which is to dedicate particular attention and which is to consider as one of the guideline of our business strategies. The GommAmica products have high qualitative contents and are created with the aim to minimize the waste of resources. The low environmental impact of GommAmica promotes the use of sustainable sources and avoid the waste of virgin materials. 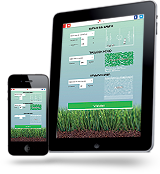 GommAmica EASYTOOL is the only application which allows to calculate the correct quantity of rubber granules GommAmica POWERFILL for the infill of synthetic grass grounds.